The sensitive judges appointments matter raised by two PILs filed by Lt Col Anil Kabotra and Ashwini Upadhyaya, on which previous chief justice T S Thakur constantly pulled up the government, came up before Chief Justice J S Khehar for the first time. 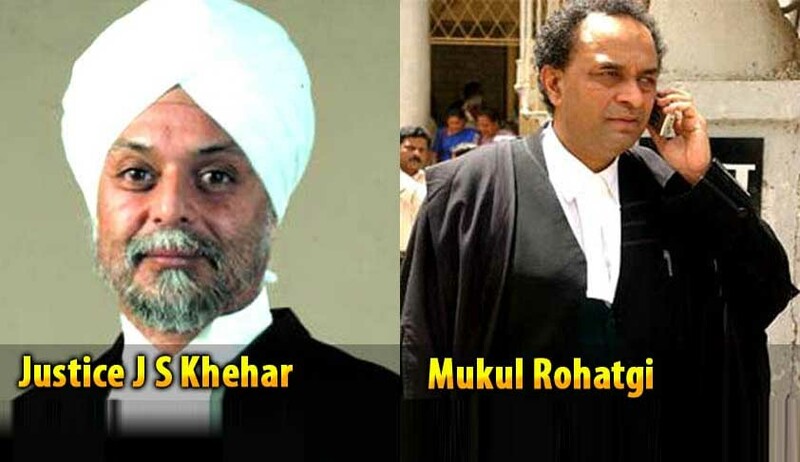 Making use of change of bench Attorney General Mukul Rohatgi urged the CJI to dismiss the PILs contending that such matters should be dealt at the administrative side through constant interaction between the executive and the judiciary and not at the judicial side in open court. But CJI Khehar rejected AG's plea saying "once we entertained a petition we cannot throw it away like this. It cant be treated in a slipshod manner. We have to pass an order and they say they are espousing the cause of judiciary. So we cannot leave it and run away". "WILL LAY DOWN RULE ON RECUSALS"
There was some heated exchange at the outset as Advocate Mathew Nedumpara urged CJI Khehar to recuse from the hearing of the PILs saying the CJI who takes decisions on administrative side on judges appointments being head of the collegium should not hear the PILs on judicial side. CJI Khehar snapped at Nedumpara and said "These days every second case someone say this judge should recuse that judge should recuse. This has become the order of the day. We will lay down a law. Nedumpara had earlier filed petitions challanging the elevation of Justice Khehar as Chief Justice. All three petitions were dismissed.
" WILL CONSIDER ALL INDIA JUDICIAL SERVICE"
On another PIL filed by advocate Ashwini Upadhyaya seeking an All India Judicial Service, the bench said all of it will be considered including the plea for setting it up, on the next date of hearing. On january 20, his retirement eve, previous Chief Justice T S Thakur once again pulled up the Centre on the contentious issue of judges appointment and transfer. It was when the petitioners reminded that despite the order of the collegium way back in February this year, several judges of the High Court and Chief Justices have not been transferred. The CJI asked AG to file a status report on the transfers and the reasons for the delay within two weeks. Appearing for Centre Attorney General Mukul Rohatgi said out of 77 names recommended by collegium, 43 names have been sent back for reconsideration. After the AG submitted a list regarding the appointments, CJI Thakur had perused it and said the collegium will meet onNovember 15 and a detailed order will be passed later in open court.